I know that there are a lot of bloggers who sometimes read this blog. I also know that there are a lot of people who read who know absolutely nothing about blogging. This post is for the latter group. 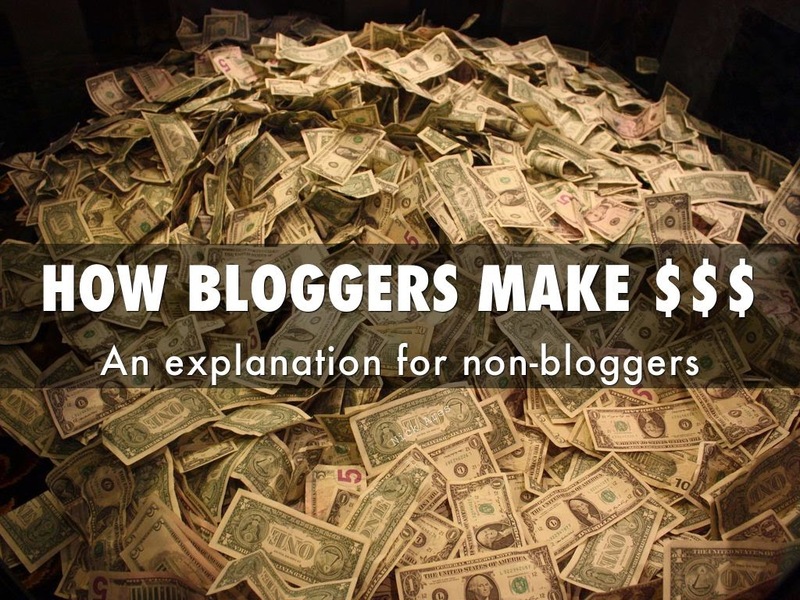 Most people are very surprised when the find out that I make money blogging. In the spring, when Greg and I were applying for a home loan (and we had to explain to a lot of strangers why we bought an $.89 pack of gum four months ago) our loan guys were all sorts of confused by the money coming in from my blog. "Wait you make money on your blog?" "They don't pay me to write. They pay me to advertise their product." "So you work in advertising?" "No. I write a blog." "What makes your life so interesting?" "And you make an actual income from them reading?" "How much do you make?" Usually about that point people stop trying to figure it out and just give up. I can't say I blame them. Blogging is a relatively new "job field" (if you want to call it that) so there is a lot that the majority of the population does not know or understand about blogging. There is no blogging major at school, no book that teaches you the ins and outs of how to do it. My entire blogging career has been a lot of trial and error, figuring it out as we go. I have been blogging consistently for three years. This year I make enough money that I can stay home part time and still make the same amount as I would working part time. So, basically I make half of a teacher's salary. After three pain-staking years. It is definitely not a get rich quick plan! I love it though, and the part time income from my blog allows me to stay home every other day so I am beyond grateful. The majority of my blogging income comes from doing a "campaign." That means I am working to sell a product or create awareness about a product through my blog. For example, this is a campaign I am currently working on within a few days I will write a post advertising that product. Seems simple enough, right? But then, how do companies like REI know to find a blogger like me to help them get the word out about their product? They work through a media group. A media group to me is basically what an agency is for an actor. I apply to be a part of a media group and I am accepted based on the size of my blog, the content of my blog, etc. Brands like Target or Skechers will tell a media group that they want x amount of bloggers to write about a product and that they are willing to pay x amount of money for it. The media group will then match the brand with bloggers who are part of its group. The media group chooses the bloggers who it thinks will best fit the campaign. Right now I mainly work with three different media groups- Linqia, Pollinate, and Social Fabric. With Social Fabric and Pollinate I am notified when there is a possible campaign that I can "apply" for. To apply for a campaign I'm usually required to state what monthly traffic is to my blog, what my following is on social media sites such as Instagram, Twitter and Facebook, and leave a link of a blog post on a campaign I have recently been involved in. I am also required to "pitch" an idea for how I would promote the product. With Linqia, I am given a campaign when they think my blog matches it- no application necessary! Payment is different depending on the media group. Pollinate and Social Fabric both pay a flat fee- usually around $100-200 for a campaign. This entails a blog post and corresponding social media posts. (Usually I am required to post about a product on my blog, my facebook page, my twitter, and my instagram.) Linqia pays per click. That means the more successful I am at advertising their product, the more I get paid. This is the campaign I am currently doing for Linqia- if you see me sharing it a lot that's because I am trying to meet my click quota! If I exceed my click quota, then I have a higher earning potential for the next campaign. So then why does it matter how many people read your blog? Well, you can't get campaigns like the ones I talked about above unless you have a certain sized audience. If there are 1,000 pageviews a month on your blog, that's great for you, but it doesn't mean much to advertisers. If there are 100,000 pageviews on your blog a month, however, advertisers will be much more interested in working with you. The bigger the size of your blog audience the more you can make per campaign and the more advertisers will want to work with you. I dream of a day where I could do one campaign a month and make a full time blogging income that way. Yah, it's never going to happen. My information for sponsoring can be found here. I have cut down considerably on what I am willing to offer people with the eventual hope of phasing sponsors out completely. I love the relationships I gain from doing a sponsorship program, but it is a lot of little details to remember for not a big chunk of money. Also, I think my readers appreciate it more when all posts on the blog are written by me. That being said, I still rely on the income from sponsors for now. ***July 2015 edit- I know longer offer a sponsorship program on my blog. It's still a great way to make income for those who are interested. See those faces that are on the sides of my blog? They paid to be there. For bloggers, that usually comes with whatever sponsorship choice they elected. I do have some ads from BlogHer and AdSense. These are both paid per click deals, so when you click on a sidebar ad, that is helping my income. I don't make a ton from this, usually around $50-100 a month, but it is awesome because it is a totally passive income. I don't have to do a thing after I install the blog code and yet I get $50 a month. A few years ago sidebar ads were much more expensive than they are now and a blogger with a huge audience could support herself through sidebar ads alone. Nowadays sidebar ads aren't quite so profitable. ***July 2015 edit- I know longer offer a sponsorship program on my blog. If I put a link to Amazon and you click on that link and then buy something from Amazon that day, I get a percentage of it. That's the idea anyway. Truthfully, I am not a part of any affiliate programs right now because I have never sat down and figured out the coding and how to do it. I have tried many times, gotten frustrated, and then given up. I don't talk about enough products on my blog to feel like I would really make that much anyway. This, however, is how the big fashion bloggers make bank. Every single day they are showing off tons of things that they are wearing and buying. If I click on one of their links and buy the $75 sweater they are showing from J.Crew, they get a percentage. For those fashion bloggers who have thousands of pageviews a day, you can imagine that it does start to add up. 5. NO ONE PAYS ME TO ACTUALLY "WRITE"! The thing I don't like about blogging is that no one pays me for my actual writing. That is because blogging is free for the consumer. You right now are reading this particular post for free. 80% of the posts I do are non paid posts- I am getting absolutely zero monetary compensation for writing. So why do I write so many freaking posts? By consistently posting, I have established a readership. I can rely on a certain amount of people visiting my blog each day, and therefore qualify for some of the bigger campaigns like this one. Those campaigns bring in enough money for me that I don't mind not getting paid for most of the posts I write. The dream would be to work for a magazine or internet site that pays me per article. But that's not what blogging is. And to be 100% honest with you, I'm not real sure how that process even works. I know a lot of bloggers write for sites such as babble or thoughtcatalog and get paid to do it, I just don't know how. Someone want to enlighten me on that? And that's it, folks! That's how I can write about not having a Halloween costume ready and the stupid things my students say and somehow in a roundabout way get paid a little bit for it. It was so so so much work in the beginning, when I was constantly trying to grow my audience. Now I am comfortable with the size of my blog and the place it is at, and it doesn't take as much maintaining. I'd say I devote about 10-15 hours a week on my blog. Considering that I make the same blogging as I do teaching and I work 20-25 hours a week teaching, I'm not complaining!